Apple is widely known for producing hefty, powerful and sophisticated gadgets as manifested by its latest flagship devices — the iPhone 7 and iPhone 7 Plus. Apparently, anyone can take pride for owning such a contemporary smart gadget that is more capable of doing a lot of things for your daily routine. Given the iPhones’ smart functions and file storage allocation, users would consider it as their primary repository device for significant files and even some confidential information. While this is beneficial for the end-user, it also denotes a risk. It is inevitable for anyone to misplace their phones or even worse, lost it. Seeing all these possibilities, iPhone developers ensure that each of their device integrates more advanced security measures, providing end-users alternative solutions in these inevitable situations. One of these is a built-in security tool called Find My iPhone, Apple’s patented application that is designed to let you trace, access, lock, or erase your lost iPhone, iPad and other Apple devices. If you are new to iOS and that you need further assistance on how to use this tool on your iPhone 7 Plus, this post will help you get started and walk you through the entire process. Read on to learn more. With Find My iPhone, you can locate your device or your family members’ devices on a map, play a sound on your device, lock your device using Lock Mode, remotely erase your personal information from the device and protect your device with Activation Lock. There are a few requisites you need to note in order to use Find My iPhone to find your device and take additional actions to help you recover it and keep your data safe. Find My iPhone needs to be set up or enabled on your device before you can do any of its designated functions. To get started in using Find My iPhone, navigate to icloud.com/find and then sign in with your Apple ID username and password. If you can’t see Find My iPhone on iCloud.com, it means that you only have access to iCloud web-only features. In this case, you will need to set up iCloud on your iPhone 7 Plus. You can also use Find My iPhone on a computer to locate or remotely access your lost device. Just be sure to use a browser that meets the system requirements for iCloud. Again in order to use iCloud, you will need an Apple ID, active Internet connection and up to date software. You can view more details on the recommended and minimum system requirements for iCloud on the Apple Support page. For as long as you’ve set up and enabled Find My iPhone on your missing device, you will have a higher chance of finding it, remotely access or erase your device if necessary. Follow these steps to get started. Tap Settings-> [your name]-> iCloud. Scroll to the bottom of the iCloud screen and then tap Find My iPhone. If prompted to sign in, enter your Apple ID and password. Once you’ve successfully set up Find My iPhone, any other iOS devices including Apple Watch and Airpods paired on your iPhone 7 Plus are automatically set up as well. It is also recommended to set up Find My iPhone on your other iOS or computers (Windows or Mac). To use Find My iPhone to locate and protect your iPhone 7 Plus if ever it gets lost or stolen, just sign in to iCloud.com or open Find My iPhone app on your other iOS devices to locate and view your missing device on a map, play a sound to help you find it, use Lost Mode to lock and track it, or remotely erase all of your personal information from the missing iPhone. You can register up to 100 devices with the same Apple ID for Find My iPhone. Sign in to iCloud.com using your Apple ID and password. If you see a green dot, it means that your missing device is online. This means that it can be traced. You can also view the last time the device was located. If you see a grey dot, it means that your missing device is offline, turned off, or not connected to the Internet. Select your iPhone 7 Plus from the list of devices to locate. If your iPhone is online and traceable, you can see its approximate location on the map. If Find My iPhone can’t trace your device, the last known location will be posted for up to 24 hours. In this case, your option is to get an email by the time the device is online. To do so, select the option to Notify me when found. What to do when your missing iPhone 7 Plus is online? If your device is online, you can update the location by clicking the green dot on the map then click Refresh. Move the map by dragging it. Click the + button to zoom in or – button to zoom out. Change the map view by clicking the current view in the bottom-right corner and then select the view you want to use. If you have set up Find My iPhone on your other iOS device, you can use the other device to locate your missing iPhone 7 Plus. To do so, open Find My iPhone, tap Help, and then go to Locate your device. Information on maps and location of your missing device may vary slightly depending on the data collection services provided by third parties. These services may not be available in all geographic locations and are subject to change. Aside from locating your iPhone 7 Plus, you can also use Find My iPhone to play a sound, lock your device with Lost Mode, erase your device or use Activation Lock on it. Here’s how they work. Play a sound. If you think that your device is just misplaced nearby, you can use Find My iPhone to play a sound on your missing device to help you find it. To do so, open Find My iPhone on your other device, click All Devices, then select the missing device from which you want to play a sound. Finally, click the Play Sound icon. If the missing device is online, it will vibrate and plays a sound immediately for two minutes. If it is offline, the sound will play the next time it get’s online. After the sound plays, a confirmation email is sent to your Apple ID email address. Use Lost Mode. With Lost Mode, you can lock your lost iPhone with a passcode so others won’t be able to access your personal information. Enabling this feature also tracks any changes to the location of your missing device. 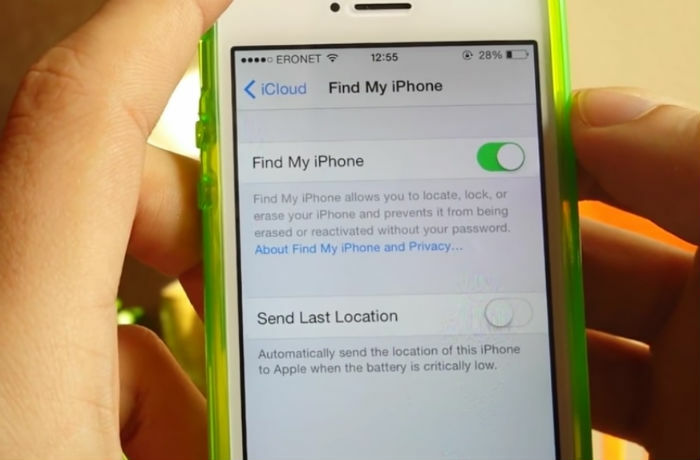 You can activate Lost Mode on your missing device with Find My iPhone on iCloud.com. When Lost Mode is enabled, you can display a custom message on your missing device screen. Alerts and notification sounds for messages will also not show on the missing device when in Lost Mode. Only phone calls can go through. Other sensible information such as credit or debit cards setup for Apple Pay on your missing device are also suspended even if the device is offline. For Lost Mode to work as intended, your iOS device needs to meet the minimum system requirements. To enable Lost Mode or lock your missing iPhone, open Find My iPhone in iCloud.com, click All Devices then select your missing iPhone 7 Plus. Finally, click Lost Mode or Lock then follow the onscreen instructions. If you have set up Family Sharing, you can also enable Lock Mode for family members’ devices. Lost Mode locks your screen with a six-digit or four-digit passcode and lets you display a custom message with your phone number to help you get back your missing device. Erase your missing iPhone. Before you erase your device, make sure that you have already tried locating or playing a sound on it because after you erase it, you can no longer use Find My iPhone to track it. To erase your missing iOS device, click All Devices tab on Find My iPhone, then select your missing device. From the device’s Info window, click Erase [device name]. You may need to enter your Apple ID password, enter security questions or enter a verification code that is sent to your other devices. Otherwise, just click Trust if prompted to do so. To erase your missing iPhone using a different iOS device, open Find My iPhone on the other device, tap Help and then go to Erase your device. After you set your device to erase, the remote erase begins when the device is online. You will then receive a confirmation email to your Apple ID email address regarding this process. If your device is offline, the remote erase instigates the next time it’s online. Once you find your iPhone you can restore the information using iCloud Backup or iTunes. Use Activation Lock. This feature automatically enables when you turn on Find My iPhone on your device. You can use Find My iPhone Activation Lock to erase, reactivate, access, or disable Find My iPhone on your device. With this feature enabled, anyone won’t be able to reactivate your device without your permission. Your Apple ID is securely stored on Apple’s activation servers and linked to your device. From that point on, your password is required before anyone can turn off Find My iPhone on your device, erase, or reactive and use it. If you forget your password, you can reset it on your Apple ID account page or contact Apple Support for further assistance. Rest assured, with Activation Lock working in the background, anyone will have more trouble using or selling your missing device. What to do if your missing iPhone 7 Plus is not shown in Find My iPhone? If you don’t see your device on iCloud.com or in the Find My iPhone app or prompted with a message saying that your device is offline, here’s what you can do next. Verify and ensure that you have signed into iCloud on the device you use for finding your missing iPhone. If you are using another iOS device that runs on iOS 10.3 or later versions, tap Settings. If you are prompted to Sign In to your [device name], tap it and enter your Apple ID and password. Verify if Find My iPhone is enabled on your other device. To do so, head over to Settings-> [your name]-> iCloud-> Find My iPhone-> then tap Allow. If you have multiple Apple ID accounts, check which Apple ID you signed in with. It’s possible that you signed in to iCloud.com or Find My iPhone using a different Apple ID than the one used on the missing device. To verify this information, sign in to Find My iPhone or iCloud.com with your other Apple ID accounts and then look for your missing device. Verify and ensure that the date and time settings are correct. To do so, go to Settings-> General-> Date & Time on your other device and then enable the option to Set Automatically. Doing so will automatically set your date and time based on your time zone. What to do if you see your missing iPhone 7 Plus in Find My iPhone but it’s OFFLINE? If Find My iPhone indicates the your missing device is Offline, No Location available, or Location Services Off, this means that your device might be offline because it’s powered off, the battery has run out, or over 24 hours had passed since the last location was sent to Apple (if Send Last Location option is enabled). If your device is connected to the Internet, you can view the remaining battery in the upper-right corner of the information page. Another possible reasons as to why are seeing any of the aforesaid messages is that Find My iPhone or iCloud services are not available on the current country you are in. Other countries do not support these features due to technical limitations or local law prohibits them. What to do if the location circle on Find My iPhone is too large? You might see the location circle shown on iCloud’s Find My iPhone page is too large especially if the device is still trying to determine a more accurate location. In this case, just wait for a few minutes and refresh the page or map again. If the location circle remains large, then it’s possible that your device might not have access to a Wi-Fi or GPS signal. What to do if Find My iPhone is not enabled on your lost iPhone 7 Plus? As alternative solutions to those who failed to turn on Find My iPhone prior to losing their device, changing passwords and reporting the device as missing are by far deemed the best available options for them to resort to. Report your lost or stolen iPhone 7 Plus to law enforcement. Lost or stolen devices can be reported to local law enforcement. Usually, law enforcement will request the serial number of your device so you might as well consider taking note of it right now for backup and safekeeping purposes. The serial number is usually printed on the surface of your iPhone. If not, you can head over to your iPhone Settings-> General-> About menu. If your iPhone syncs with iTunes, you can use iTunes to locate the serial number of your device. It is usually printed among other information on iTunes preferences under the Devices tab. Report your lost or stolen iPhone to your wireless carrier. You can request your wireless carrier to disable your account to prevent unauthorized calls, texts, and data use from the lost or stolen device. Your wireless carrier can deactivate your SIM card or account, if necessary. Doing so will turn off services for your missing iPhone. However, you will no longer be able to find it, play a sound, send a message, issue a lock request, or erase your iPhone 7 Plus with Find My iPhone. If Find My iPhone is not enabled on your iPhone 7 Plus or any other Apple device before it went missing, no other Apple service that can locate, track or flag your device for you. This is the main reason as to why Apple encouraged iPhone and iPad users to consider this among the first things to do from the moment they get hold of their new device. Hence, you too should consider doing so. In this case, your best option is to contact your device carrier or Apple Support and seek further assistance and recommendations.